*closed last Monday of every month. While Paris 1930 is The Landis Hotel's most revered French restaurant, its first-floor sister, La Brasserie, has charms of its own. The Alsatian cuisine is the perfect counterpoint for Taipei's one and only venue with authentic banquette seating, replete with top-grade, brown-leather upholstery, and mirrored walls. The dishes are heartier and satisfy the halest of appetites. Specialties include various tantalizing sausages and sauerkraut, all cooked to perfection. So, you will find no overboiled cabbage and greasy pork dishes here! 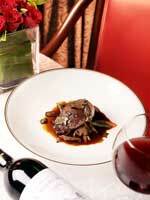 Taipei has only one establishment restaurant and that is Paris 1930 at The Landis Hotel. As Taipei's premier restaurant, expect to be pampered with the finest food, wine and service that Taipei has to offer. Chef Neil Jamieson is a master of nouvelle cuisine and that artistry is apparent in the meticulously elegant presentation that, despite its beauty, is still first and foremost about pleasing the palates of Taiwan's most discerning diners. If your budget can stomach it, you will also find a range of wines without equal, not only in terms of selection, but also fortunately, in terms of price.